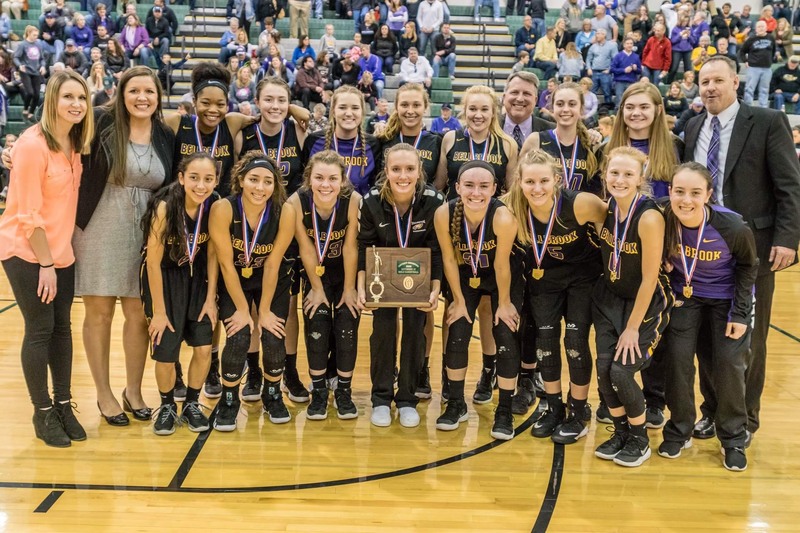 “One Win, One Chance and One Team” has been the theme for the Bellbrook Lady Eagle basketball team. The girls are preparing to play their 6th game of the postseason this Friday, March 9 versus the AP ranked 4th team in the state, the Tippecanoe Red Devils. The Red Devils and Golden Eagles have not played each other yet this season, but the two teams are far from unfamiliar with each other. Tippecanoe was the team that sent Bellbrook home last season after beating them in the District Finals by 3 points. The teams have had differing paths to get to this Regional Final game. Tipp City earned the #1 seed for their sectional and the closest game in the tournament has been against Kenton Ridge with a five point differential. During tournament play, Tippecanoe has beaten opponents with a combined 131 points. Bellbrook’s path has been more difficult with only 95 points separating the team and their opponents. The team had to play three teams who they had already faced earlier in the season. Chaminade Julienne was the first familiar task for Golden Eagles who beat CJ by a score of 65-48. The second round was a lot tighter and Bellbrook edged CJ by only four points. To win the Division II Lebanon sectional, the girls were faced with #1 seeded Valley View. The Spartans had beaten the Eagles twice already this season; however Bellbrook did not get the memo as they jumped out to a 5 point lead and never looked back, eventually winning by 8. Bellbrook and Tippecanoe both faced Cincinnati teams for the District Championship. Both squads won their games by a margin of 15 points or more. The Red Devils are led by senior guard Maddie Frederick, who averages 15.8 points per game, and fellow senior Alison Mader averages 14.3 point per game. Bellbrook, however, should match up well as the team is led by senior guards Bekah Vine and Cassidy Hofacker who average 10.7 and 11.7 respectively. In the regional semifinals the Golden Eagles played a familiar opponent in the Franklin Wildcats who are also members of the SWBL. Bellbrook won in convincing fashion and also held Layne Ferrell, Franklin and the SWBL’s top scorer, to 8 points. Before the game, Coach Tincher looked at his team and gave them the challenge of holding Ferrell to 9 points or lower. Ferrell went into the game with a 50 game streak of scoring in double figures. That streak for Ferrell ended with the Wildcats’ season. Friday night, Springfield High School is the place to be for girls’ basketball fans. “This is a big game, this is for a trip to Columbus, it’s a big deal for our team and for our community,” sophomore starter Kayla Paul said when asked about this the Regional Championship. The last time the Golden Eagles where in the Regional Finals was in 2012, when the team faced a very talented Carroll High School team led by University Dayton Recruit Kelly Austria. The game went in favor of the Eagles who made only their second trip to state in school history. One thing is definite on Friday night: a team from Dayton will be advancing to Columbus for the Division II final four.